Don’t let your car bake in the sun or get covered in piles of snow anymore. Instead, turn to the professionals at Pro Home and Sunrooms for the installation of one of our durable and low-maintenance carports. We have proudly served Rochester, New York, and the surrounding areas since our founding in 1967. Our family-owned and -operated company is the largest TEMO dealer in the area, which makes us the most reliable source of high-quality shading products. And, we will ensure that your carport is installed correctly the first time because we only utilize factory-trained and -certified installers that are all kept up-to-date on the best installation practices for all TEMO products. 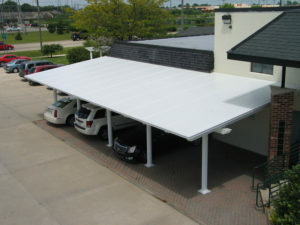 For more information about how the carports offered by Pro Home and Sunrooms will help protect your vehicle throughout the year, contact us today. We proudly served residents of Rochester, NY, and all surrounding areas.